I came home after a long day at work and wanted to use up the vegetables I had on hand. I often hear reports on how much food is wasted in our society and recognize how my small family of four contribute to this problem. With that in mind I set to work on my veggie drawer. I pulled out green beans, onions, garlic, celery, zucchini and yams and started chopping. Mom instilled in me and my siblings the importance of being able to open up the fridge and create a meal. Still grateful to mom for that culinary gem. Garnish with toasted pumpkin seeds and fresh shaved parmesan or feta crumbles. Sauté the onion in olive oil over medium high heat until till almost translucent. Add the garlic, herbs, salt and pepper and sauté for 3 minutes. 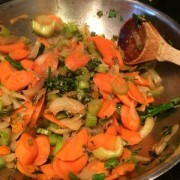 Add the rest of the veggies and sauté for an additional 5 minutes. 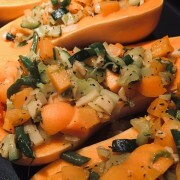 Scoop the sautéed vegetables into the butternut squash and bake at 350 deg. F for 45 minutes or until thickest part of squash is tender. 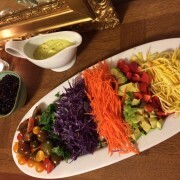 Here is one of my go-to recipes when I am busy but want to put on a beautiful display of color and flavor! I let Mother Nature take the credit for the rich colors of red, yellow and orange from the heirloom tomatoes. These bright colors are the result of bioflavonoids called carotenes. Carotenes are nutrients that have been well researched for their immune and cardiovascular benefits. Lycopene is one of the carotenoids found in tomatoes. This rich antioxidant provides protection against cardiovascular disease, prostate cancer, and asthma. So, sit back and enjoy the rich color and flavor knowing the multiple health benefits this dish provides. The only suggestion I would make for individuals with autoimmune diseases or inflammatory diseases such as eczema would be to avoid the nightshade family if you are experiencing worsening of symptoms after ingesting tomatoes. The nightshade family is made up of tomatoes, potatoes (yams and sweet potatoes are ok), eggplant and peppers. Arrange the tomatoes alternating colors on a long serving platter. 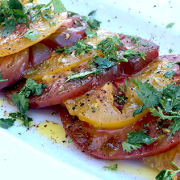 Sprinkle the sliced basil over the tomatoes and drizzle with olive oil. Finish with fresh ground pepper and sea salt to taste. 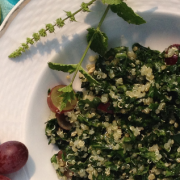 I love the simplicity of this dish as well as its power-packed nutrient content! Cauliflower is of the cruciferous family that is well known for its anti-cancer properties. Particularly rich in cauliflower are immune boosting vitamins such as Vitamin C, Vitamin K, folate, Vitamin B6 and pantothenic acid. I add the vibrant yellow herb turmeric for its anti-inflammatory properties. I suggest using turmeric in cooking for my patients with inflammatory conditions such as autoimmune and gastrointestinal inflammatory conditions. I also recommend turmeric for its liver supportive and anti-cancer properties as well. The powerful combination of turmeric and cauliflower is definitely medicinal food. In a small mixing bowl, combine turmeric, olive oil and garlic and mix until evenly combined. 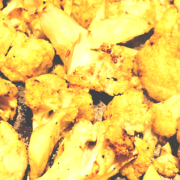 In a large mixing bowl toss the turmeric and olive oil mixture with the cauliflower until evenly combined and pour onto a cookie sheet and bake in preheated oven for 25 minutes or until cauliflower is lightly browned. This weekend when the weather got unusually hot, I was pleased with myself for remembering a recipe for a cooling dish that my grandma used to cook on hot summer days back in my home country of Uzbekistan. 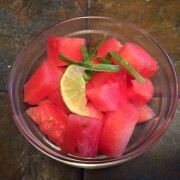 Summers are super-hot there and any summer feast includes a cooling dish. The cooling properties of this dish come from the chilled yogurt base and lots of greens. Green in Chinese Medicine is a very cooling color that is, among other things, very good for your liver. In Russian, this dish is called “okroshka” which means “chopped up”. 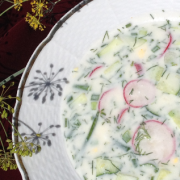 This summer’s sun blessed my garden with a good harvest of cucumbers, radishes and dill so with this dish, I found the way to eat them fresh! Chop vegetables and dill into cubes. Mix yogurt with 2 cups of cold water. Add vegetables to yogurt mix. Add salt and/or pepper to taste. Voila, your cooling, liver loving, vegetarian summer soup is ready in 15 minutes! With the warm weather of summer upon us, my children love making fresh and icy lemonade. Here is one of our favorite Vitamin C rich and tasty thirst quenchers. No sugar added, just naturally sweetened with local honey! Switch out the raspberries for your favorite flavors such as strawberries, blackberries, blueberries or a berry blend. In a blender, add the lemon juice, honey and berries. Blend until evenly combined. Pour into a large pitcher and add the water and mix until evenly blended. Serve with ice, a lemon slice and fresh raspberries. 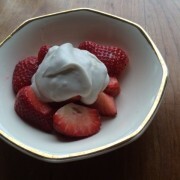 I woke this morning wanting fresh fruit and something rich and creamy. The kids love whipped cream so I pulled out a can of coconut milk. This dairy alternative is my go-to for so many recipes. Coconut milk is rich in medium chain saturated fatty acids. The saturated aspect of coconut milk has been an area of contention among some researchers and has led to confusion among consumers. 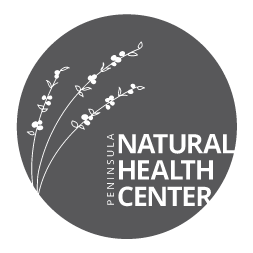 What I recommend is that with any fat, too much can lead to central weight gain and increase your risk of cardiovascular disease, diabetes and other inflammatory diseases. The difference between coconut and steak saturated fat is that coconut saturated fat has lauric acid. Lauric acid is converted in the body into a highly beneficial compound called monolaurin. Monolaurin is an antiviral and antibacterial compound that can fight a wide variety of organisms. So, sit back and enjoy several servings per week of coconut milk. I also used this over my Deliciously Gluten, Dairy and Egg Free French Toast. 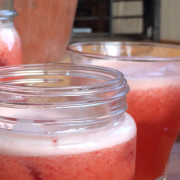 Whip with an immersion blender or blender and enjoy!